Thank you so much for wonderful interpretation Richard. Viewing this picture gives me a desire to know their history. I get the feeing that all that they have seen may not have always been nice but yet they not only survived but also will look you straight in the eye and are not afaird to enjoy some music. Very nice. Many thanks for wonderful comment again Neven. All my best wishes and regards. Thank you so much Mia. It's a beautiful image. My compliments! I'm very glad that you enjoyed it. Many, many thanks for your nice comment Marcio. Glad to know that you like it. You have a rich and wonderful collection of documentary stree work ; hugs. Thank you very much dear Pooria. congrats, really well deserved dear vehbi. You have encouraged me by your lovely comments. Thank you Teresa for your kind comment. Thank you for your kind comments dear Tom. Much appreciated. Thank you very much for your appreciation Michele. My best wishes. Regards. Many, many thanks for your nice comment dear Ania. They are alcoholic/almsman and gipsy. This instrumet is a "reed" and turkish name is "ney". He is playing sufi music. Thank you so very much for kind comment Azza Khalil. Thank you so much dear Mojgan. Nice to hear good words from you. Thank you very much for your kind words and comment Baha. And very well deserved award!!! Congtratualtions and thanks for your comment on my Rira.. Very nice to hear good words from you. You're so kind, I appreciate your comment. Wish you all the best my friend. Wow.. What a beautiful street shot!! An excellent portrait captured here. I like the eye on the first one and the composition with the one playing in the background. An excellent work and a well deserved award. Many thanks for nice words dear Yazeed. Glad you like it Maja. Thanks a lot for your kind words and appreciation dear Srna. Heartfelt best wishes and hugs. I appriciate your words of kindness dear Malules. congrats on the award, dear friend!! Thank you so much dear Atish. Thanks a lot dear Yazeed. Thank you very much dear Bubai. Kind regards with my best wishes. Thank you very much for your kind comment dear Luca. Thank you so much Arindam. Thanks a lot for kind words Sanjoy. Thank you very much for kind comment Hai. Thank you so much Enrico. I very like your pic! Great! Very good shot. Good tones. Thank you so much for kind words dear Srna. Superb my dear Vehbi !!! Glad you enjoyed it. Thanks a lot dear Kallol. Thank you very much dear Nanda. You have always encouraged me by your nice and kind comments. Best wishes and hugs my friend. Thanks a lot for your kind words dear Malules. Excellent composition, nice bw tones and textures. Fabulous street portrait my dear friend. Only to hear the music!! Fabulous street portrait, dear Vehbi!! Thank you so much for nice comment Kelly. Glad to you like it. Amazing! Love the textures and the detail..right down to the ciggarette waiting on the step for him to finish!! Thank you so much for your nice comment dear Panyakit. Thank you very much Marko. Thanks for your kind words dear Arian. Glad to you enjoy it. My best wishes and hugs. I have gotten all 3 messages, thanks ! You're dead right dear Harry. This man is a gypsy. They came 600-700 years ago from India and spread all over the world. But instrument is different. This is a "reed" and turkish name is "ney". He is playing sufi music. This man is gypsy. They came 600-700 years ago from India and spread all over the world. But the instrument is different. 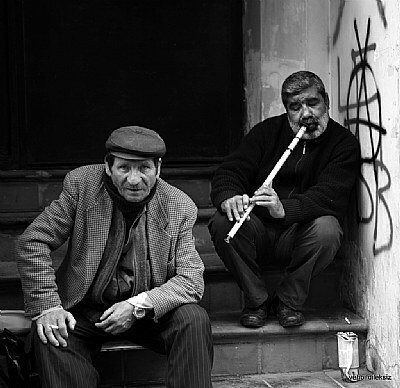 This is a reed (turkish-ney)and he is playing sufi music. Thank you so much dear Anindya.